The store manager in the shopping centre: retailer, ambassador and seismographer! Surrey Business School researchers Professor of Retail Management Andrew Alexander and Chair in Retailing and Marketing Christoph Teller, have been working to improve our understanding of the role and contribution of retail store managers. In today’s competitive omni-channel retail environment, brick and mortar retailers increasingly compete on the basis of the customer experience that they can deliver. Part of this experience occurs in the store, but part depends on the experience customers have in the surrounding shopping environment. In a recent study (together with Professor Anne Roggeveen, Babson College, MA, USA) they investigate the role and potential of store managers as boundary spanners in shopping centres. Boundary spanning store managers negotiate boundaries between the parent retail organization and the shopping centre and between the shopping centre and customers. They are key individuals who have the potential to act as both ‘ambassadors’ and ‘seismographers’ not only for their organization but also for the wider shopping centre network. Analysis reveals six types of boundary-spanning activities. 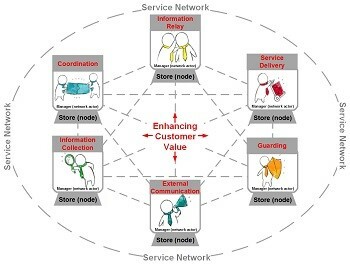 Four serve to represent the organization and network (service delivery, coordination, guarding, and external communication), while two others are more informational in nature (information collection and relay). The research highlights the wide range of activities a store manager can undertake to improve the competitiveness of their organization and the wider shopping centre network by enhancing customer experience and thus creating value. The research suggests a number of practical implications concerned with the communication of the boundary spanning role and its potential, the identification of boundary spanning champions and the facilitation of those who undertake this important role. You can download the full research paper for free (Open Access) by clicking on here: ‘The Boundary Spanning of Managers within Service Networks’* published by Elsevier in the Journal of Business Research. *The authors would like to acknowledge the Academy of Marketing and the British Academy of Management for their support in relation to this research.